Enterprise Home Screen is a free Android app from Zebra Technologies that provides a simple way for administrators to control access to apps and settings on a Zebra device without the need to write custom code. Using a simple touch interface, EHS easily limits usage to one or more specified applications, prevents changes to device settings and locks down the file system. It can be configured in seconds, and settings can be deployed via MDM. EHS settings are stored in a simple XML file that's easy to read and edit by hand, if necessary. EHS works by inserting itself in place of the stock Android app launcher and home screen. When first run, it presents a screen like the one below, offering a choice of which home app to open and whether to make the selection permanent. EHS also can be installed as the default launcher, bypassing the selector dialog. Enterprise Home Screen does not support localization. Administrators can grant or restrict access to individual features or hide the settings panel entirely. This version of Enterprise Home Screen has been approved for use with the Zebra Android devices listed below. End of support for EHS on Jelly Bean: EHS 2.4 will be the last version of Enterprise Home Screen that will be supported by Zebra on devices running Android Jelly Bean. Online-only documentation: Beginning with EHS 2.4, the user guide will no longer be bundled with the EHS download package. Bundle Data Option - allows injection of app parameters, user data or other key-value pairs into an app on launch. App Launch Flags - permit one or more Android Intent flags to be specified when an application is launched, directing launch behavior as required. Service Auto-Launch - permits one or more Android services to be started whenever EHS launches. Wildcard Character - reduces the lines of code required in the EHS config file to specify apps for display in User Mode. Custom App Icons - permits customized icons for apps and links, overriding the default system icons. Custom Title-bar Icons - permits a custom icon to be displayed in the EHS Title Bar, overriding the default EHS icon. App Icon Size - provides five sizes for Admin- and User-mode application icons. Battery and Wi-Fi Quick View - displays real-time status of the device battery and Wi-Fi signal on a single screen. App Icon Label Text Color - is now white on a transparent background to improve readability. 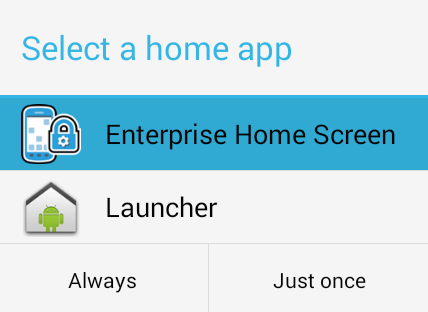 To implement these features, download Enterprise Home Screen 2.4. Status Bar Pull-down behavior has changed. A new feature in UI Manager allows the Status Bar Pull-down (referred to there as Notification Pulldown) to be controlled through EMDK, StageNow or a third-party mobile device management (MDM) system, overriding any EHS setting. Applies only to devices with MX 6.0 and higher, which is for Android Lollipop and later. Status Bar Settings Icon behavior has changed. While disabling such access to the Settings panel is not supported through EHS on all devices, a new feature in UI Manager allows the Status Bar Settings Icon (referred to there as Notification Quick Settings Icons) to be controlled through EMDK, StageNow or a third-party MDM system, overriding any EHS setting. Applies only to devices with MX 6.0 and higher, which is for Android Lollipop and later; any prior device limitations remain. Android L retains the Recent Apps list after device reboot. If this poses a security risk, the list can be cleared using App Manager through EMDK, StageNow or a third-party MDM system. For more information, see Security Notes in the Advanced Features section. Kiosk Mode should not be used with Screen Pinning, a feature in Android L that works in much the same way. The Bypass Keyguard feature fails to unlock the screen after an Android L device is rebooted. This feature works normally on devices running KitKat and Jelly Bean. Android L allows screen orientation to be changed through the Quick Settings panel only when EHS is configured to accept the System orientation setting (the EHS default). If an EHS administrator sets the orientation to landscape or portrait mode, the device user will no longer be able to change the orientation setting. Enable/disable device reboot when EHS is first launched after installation.